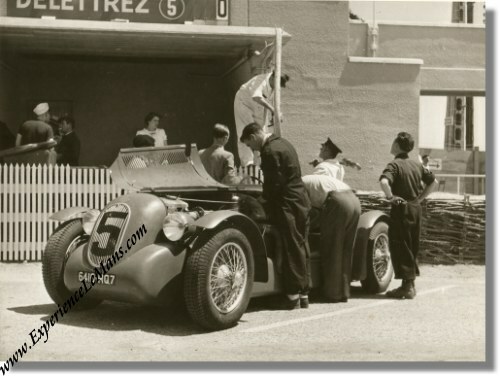 Vintage 1949 photo of Delettrez Diesel at the Le Mans 24 Hours. This vintage & original 1949 photo shows the Delettrez Diesel before the start of the 1949 running of the 24 Heures du Mans. The car in question is the very first Diesel-engined car that ever competed in the 24 Hours. The car was run by the Jean & Jacques Delettrez who owned the Ets. Delettrez company. In lap 123, roughly half way through the race, Jacques Delettrez ran out of fuel but managed to complete the lap on the starter motor! Unfortunately, the battery gave up the ghost and they were unable to complete the race. The photo measures some 23 x 17.5 cm of 9 x 7 inches and is in excellent condition.